When the weather gets colder, I turn to baked potatoes for comfort. It’s the perfect excuse to turn on the oven and warm up the house. Besides who doesn’t want a side of roasted taters for dinner? These crispy Parmesan potato stacks are a fun twist on your standard baked potato, and they’re surprisingly easy to make. A muffin tin is definitely required equipment for this recipe. I tried baking these stacks on a baking sheet, but nearly half of the potato stacks toppled over midway through the bake. The walls of a muffin pan help keep everything in place. Slice the potatoes as thinly as possible. A mandolin set to 1/16-inch is great for slicing uniform, thin slices, but you can use a chef’s knife, too. Just try to slice as thinly as you possibly can. If you’re using a mandoline, make sure to be very careful with the blade. As an extra precaution, I always wear cut-resistant gloves when I’m operating the mandoline. One or two stacks is usually enough for each person. If you have a big crowd coming around for dinner, feel free to double up the recipe! Just be sure to save a stack for me, okay? I purposely use a silicone pastry brush for this recipe because I found that a standard pastry brush with bristles added too much oil. 1 Preheat oven to 375F. Set an oven rack in the center position. 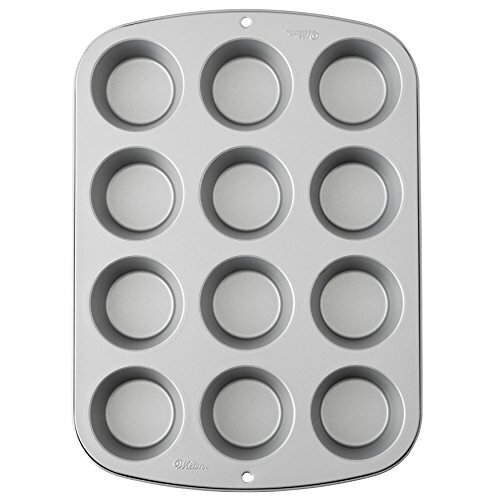 Coat a standard 12-cup muffin pan with cooking spray or brush on a thin layer of oil. 2 In a small bowl, mix olive oil, garlic powder and salt together. Set aside. 3 Slice the potatoes: Rinse and scrub your potatoes. Slice each potato thinly, between 1/8 and 1/16-inch thick. I use a mandoline to get 1/16-inch thick slices. 4 Assemble the potato stacks: Place 4 slices of potatoes at the bottom of each cup of the muffin tin. Using a silicone brush, lightly brush the potatoes with some of the oil mixture. Sprinkle some thyme leaves on top. Continue stacking several layers of potatoes, brushing the oil and sprinkling thyme leaves until you have stacked all the potato slices. Each muffin cup should be filled to the top with potato slices. Sprinkle half of the Parmesan evenly over the potato stacks. 5 Bake the potato stacks: Bake the stacks for 30 minutes, then pull out the potatoes and sprinkle the remaining cheese on top. Bake another 5 to 15 minutes, depending on how brown and crispy you want them to be (35 to 45 minutes total). 6 Transfer the stacks to plates or serving dish: Use a spoon to help release the potato stacks from the muffin pan. Season potato stacks with more salt and pepper, if you like. Serve immediately while hot and crispy. Hello! All photos and content are copyright protected. Please do not use our photos without prior written permission. If you wish to republish this recipe, please rewrite the recipe in your own unique words and link back to Crispy Parmesan Potato Stacks on Simply Recipes. Thank you! Can you make them ahead of time? You could probably do that, but you’d likely lose some hard-won crispiness by reheating it in the oven. Instead, I’d suggest preparing the stacks through step 4 the night before or earlier in the day, covering the pan with foil and then baking them off for dinner or whenever you need them. Thanks for your question, Peggy. I have been making these for a quite awhile, my grandkids are always asking me to make them. They are very great to look at and are a hit with get togethers. My husband loved these and was coming up with all the possibiltys of adding other ingredients to them. Thanks for great and fun recipe. Great question, Nancy! From my experience, things don’t crisp up as much when I use silicone muffin pans. For this recipe, I think the edges of the potato stacks won’t brown as much but they should fully cook in the silicone muffin pans. Let us know how it turns out! I made this last weekend. They were excellent. I did modify the recipe a bit. Instead of a muffin pan, I used a cookie pan. A toothpick through the stack kept them from sliding over. Just remember to remove them before serving! Oh, great tip about using a toothpick, Michael. Thanks! Oh yes they definitely look crispy and delicious! What a cute idea, great for parties too! Do you think these world work as finger food for cocktail party or would forks be needed? Hi, Patti! I think they could work as finger food, though I wouldn’t layer on as many slices–probably 9 instead of 12. If you make them shorter, you’ll have to either bake everything in batches or use another muffin pan. Also, the potato slices on the bottom tend to be a bit greasy because the oil drips down to the bottom of the wells as it bakes. If that’s not a problem, they these could be served as finger food. Thanks for the question! Sounds lovely and a great way to warm up my house during the fall/winter months. I’ve been heavily using my new spiralizer that I’ve completely neglected my mandolin. Exactly how I felt! I pull out my spiralizer often when cooking, but the mandoline has been neglected in my kitchen. Can you prepare and freeze before baking. Seems like a great recipe to prepare ahead. Hi, Mary Ann! That’s a great question! I haven’t tried to freeze it ahead yet, but I don’t see why it wouldn’t work. You might have to bake it for a few extra minutes, but it should work fine. Let me know how it goes! Oh my goodness. I hardly ever comment but these look like such a great alternative for all of the normal things I do with potatoes. Do you think garlic would also work here? My slicing gloves have saved my hands…all it took was some stitches and now I am a convert! Hi Paula, fresh garlic should work–maybe 2 or 3 cloves of garlic. I would mince the garlic pretty well so that you don’t bite into huge chunks of garlic when you’re eating it. Thanks for your question and let me know how they turn out!